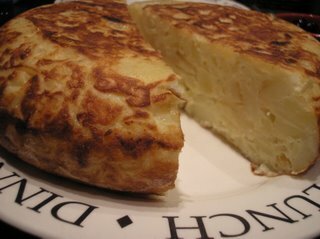 The tortilla de patatas or Spanish omelette is a typical Spanish dish consisting of an egg omelette with fried potatoes. Frequently it also includes onion, depending on region or taste. Left: Tortilla de patatas cut in half. Apart from the aforementioned names, this dish is sometimes also referred to as tortilla española or tortilla a la española (English: Spanish omelette) to distinguish it from the plain - or "French" - omelette, with no potato filling, known as tortilla francesa. In The Americas, Andalusia and the Canary Islands, it is popularly known as tortilla de papas (papa being another word for potato in these places). Other than its shared name in Spanish, which means "small torte", it has nothing else in common with the flatbread staple food from Latin American cuisine known as a tortilla. The potatoes and onions are sliced and fried in abundant oil (preferably olive oil) so they get fried but also boiled in the oil. Once drained from the oil, they are mixed with raw beaten eggs before being slowly fried again in a pan. The tortilla is fried first on one side and then flipped over to fry on its other side. This is done with the help of a plate or a "vuelve-tortillas" (a ceramic lid-like utensil made for this particular purpose), or by tossing it in the air and catching it again in the pan if it is not too big. Other vegetables can also be added, most commonly: red and green peppers or mushrooms. Prawns can also be added. Care must be taken when frying/boiling the potato pieces in oil. They should ideally be cooked over a medium heat, and watched closely so they do not become golden. It is one of the most common tapas throughout Spain and a favourite at Spanish picnics, as it can also be enjoyed cold. A tapas portion of tortilla is sometimes called pincho de tortilla as it is usually cut up into small cubes and each piece pierced with a cocktail stick. There are many variants for this dish, and almost every Spanish home has its own favourite way of preparing tortilla. Some of the many additions to the base ingredients include: green peppers, chorizo, courgettes, aubergines, mushrooms, or diced ham. The texture and width of the tortilla varies according to regions and taste. Tortilla almost always accompanied by bread and frequently by pickles such as olives and gherkins. In many bars and canteens, it is served in a bocadillo (a sandwich made with crusty bread).